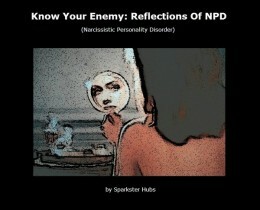 In addition to describing the sheer insidious (and often covert) nature of the narcissist, Sparkster Hubs unveils the mask of sanity by taking you on a journey through the disturbing worlds of disguised mental and emotional abuse, hidden celebrity and government occultism, conspiracy (theory), NLP (Neuro Linguistic Programming), various personality disorders and even on to topics as controversial as psychological murder. Sparkster adequately explains with detail and precision how such disturbing behaviour is carried out and how it can have a profound effect on the lives, mind and soul of victims. The cases of Jimmy Savile and Yvonne Freaney are used as examples. Know Your Enemy: Reflections Of NPD is full of insightful and enlightening, but sometimes highly disturbing and potentially shocking, information which has been written with clarity in a down-to-Earth, no-holds-barred, style. Never before has such a book been written. Warning: This book is not for the weak-minded.